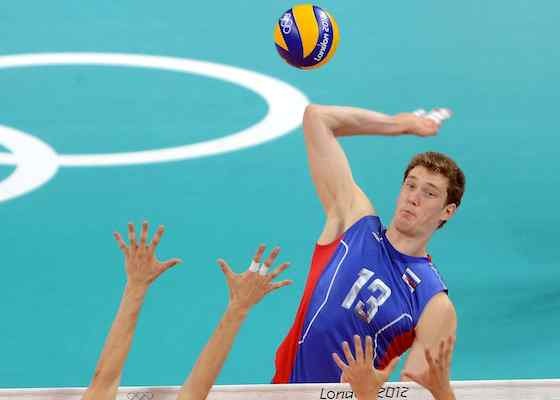 Russia's Dmitriy Muserskiy may have set a new scoring record of 31 points for an Olympic Games volleyball gold medal match, but he was determined to maintain his modesty despite his efforts sparking a remarkable comeback that resulted in London 2012 Olympic Games gold. At the end of the second set Russia found themselves 2-0 down and staring at a straight-sets loss to Brazil. However, they rallied and won the third set, then the fourth and remarkably the fifth to wrap up a 3-2 victory in front of their ecstatic fans at Earl's Court on Sunday. "I don't think this is the best match of my career," he said. "I can play better and score more points in five sets, but I've grown in confidence and that is why I played so well. The team trusted me. We were 2-0 down, it was last chance saloon and the team trusted me and the gamble paid off." The third set was the key to the victory. The Russians refused to buckle to the Beijing 2008 silver medallists and stayed focused to win the set 29-27. It altered the momentum of the match so by the final set they were in total control and could afford to let a match point slip away before they secured victory. "We saw they were tired and making mistakes so that is when we picked up the pace," Muserskiy said. "I scored one point, I scored a second and I scored a third. I was confident we wouldn't go down without a fight. "Brazil just played their game, there was nothing new. We had to find ourselves and had to find our strategy. We just weren't able to do it from the start." By the time Brazil try to win the gold medal on home turf at the Rio de Janeiro 2016 Olympic Games, it will have been 12 years since they won gold at Athens 2004. For Russia though it is the first time that they have won the gold medal since the breakup of the USSR, though they won bronze in Beijing and Athens and silver in Sydney. The gold is one of 24 they have won in London 2012, among a total of 82 medals, though it is unlikely it would have happened without Muserskiy's stellar performance. "I'm ecstatic. People were expecting and we delivered," he said. "Fifteen years. I have been waiting for this moment for 15 years. I couldn't let the team go down without a fight."